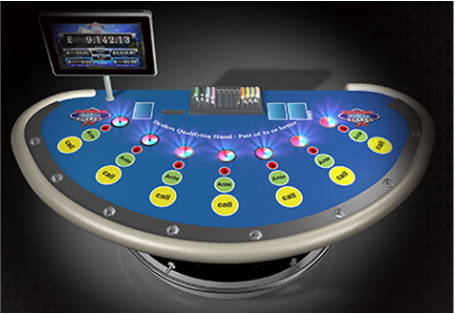 Casino Hold'em® Poker Plus is an exciting Progressive-bet for the base game Casino Hold'em® Poker. Not only is Casino Hold'em Poker Plus easy to play and deal, but players love it's fast pace and exciting Progressive Jackpots! Casino Hold'em® Poker, is similar to Texas Hold'em Poker except that players compete against the casino instead of one another. The winner is the Player or Dealer who can make the best five-card Poker hand using any combination of their own two cards and the five community cards. The Dealer qualifies if he/she holds is a Pair of 4's or better. In Casino Hold'em® Poker Plus the top three Jackpots increment when a bet is placed and 'reset' once won. If one jackpot is won, however the others will remain in play (don't reset).